Do you have a burning desire to seek Sacred Knowledge? Do you wish to be an inheritor of the legacy of the prophets? Yes? The question is, do you know how to study? What is the proper intention for this act of worship? What is the proper attitude and approach? Learning how to learn is important for every student. This course is a detailed explanation of the duties of seeking Sacred Knowledge from two very experienced teachers. In it are enlightening instructions for the beginner, and essential reminders for the adept. “My brother – you’ll not attain true knowledge except through six things. I Shall tell you about them in detail. Intelligence, a burning desire, poverty, a humbled self, The instruction of a skilled teacher, and the passage of a long time.” – Imam al-Juwayni. These lines summarize the advice of one of the great scholars of Islam to students of knowledge. It has been a tradition of the scholars to not only teach students what to learn but how to learn. Some matters remain the same for any seeker of knowledge, such as the central importance of proper conduct and respect. Others may change in different times and place, such any managing part-time study, work, and family duties. 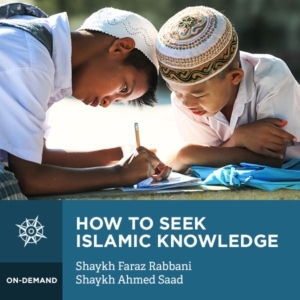 Join Shaykh Ahmad Saad al-Azhari and Shaykh Faraz Rabbani as they beautifully explain the proper mindset, internal state, outward manners required by the student, and how to avoid common pitfalls. Starting with humility to the teacher and to the approach of study, this course links the inward, outward, and practical aspects needed to make seeking sacred knowledge the noble act of worship it is.